Terradynamic researchers are developing small legged robots that someday may be used in scouting missions regardless of the surface. These robots are perfect for use in scouting missions as well as in exploration in environments such as Mars. For years, robots have been imagined to be human like. Most science fiction movies have even featured androids; robots that resemble humans. But one big hurdle is the development of legs. Most robots used now use wheels to move on surfaces. 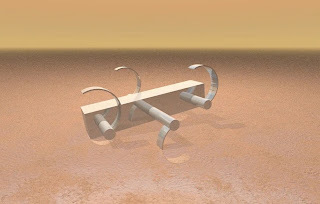 Having "legs" to travel allows robots to travers difficult surfaces such as sandy environments. Sand can clog up wheel mechanisms and hinder movement. By developing other ways for robots to move around may develop more applications that are now limited because of factors such as sandy environments. Using a combination of theory and experiment, researchers have developed a new approach for understanding and predicting how small legged robots – and potentially also animals – move on and interact with complex granular materials such as sand. The research could help create and advance the field of "terradynamics" – a name the researchers have given to the science of legged animals and vehicles moving on granular and other complex surfaces. Providing equations to describe and predict this type of movement – comparable to what has been done to predict the motion of animals and vehicles through the air or water – could allow designers to optimize legged robots operating in complex environments for search-and-rescue missions, space exploration or other tasks. "We now have the tools to understand the movement of legged vehicles over loose sand in the same way that scientists and engineers have had tools to understand aerodynamics and hydrodynamics," said Daniel Goldman, a professor in the School of Physics at the Georgia Institute of Technology. "We are at the beginning of tools that will allow us to do the design and simulation of legged robots to not only predict their performance, but also to optimize designs and allow us to create new concepts." The research behind "terradynamics" will be described in the March 22 issue of the journal Science. The research was supported by the National Science Foundation Physics of Living Systems, the Army Research Office, the Army Research Laboratory, the Burroughs Wellcome Fund and the Miller Institute for Basic Research in Science of the University of California, Berkeley. Robots such as the Mars Rover have depended on wheels for moving in complex environments such as sand and rocky terrain. Robots envisioned for autonomous search-and-rescue missions also rely on wheels, but as the vehicles become smaller, designers may need to examine alternative means of locomotion, Goldman said. Existing techniques for describing locomotion on surfaces are complex and can't take into account the intrusion of legs into a granular surface. To improve and simplify the understanding, Goldman and collaborators Chen Li and Tingnan Zhang examined the motion of a small legged robot as it moved on granular media. Using a 3-D printer, they created legs in a variety of shapes and used them to study how different configurations affected the robot's speed along a track bed. They then measured granular force laws from experiments to predict forces on legs, and created simulation to predict the robot's motion. The key insight, according to Goldman, was that the forces applied to independent elements of the robot legs could be simply summed together to provide a reasonably accurate measure of the net force on a robot moving through granular media. That technique, known as linear superposition, worked surprisingly well for legs moving in diverse kinds of granular media. "We discovered that the force laws affecting this motion are generic in a diversity of granular media, including poppy seeds, glass beads and natural sand," said Li, who is now a Miller postdoctoral fellow at the University of California at Berkeley. "Based on this generalization, we developed a practical procedure for non-specialists to easily apply terradynamics in their own studies using just a single force measurement made with simple equipment they can buy off the shelf, such as a penetrometer." For more complicated granular materials, although the terradynamics approach still worked well, an additional factor – perhaps the degree to which particles resemble a sphere – may be required to describe the forces with equivalent accuracy. Beyond understanding the basic physics principles involved, the researchers also learned that convex legs made in the shape of the letter "C" worked better than other variations. "As long as the legs are convex, the robot generates large lift and small body drag, and thus can run fast," Goldman said. "When the limb shape was changed to flat or concave, the performance dropped. This information is important for optimizing the energy efficiency of legged robots." Aerodynamic designers have long used a series of equations known as Navier-Stokes to describe the movement of vehicles through the air. Similarly, these equations also allow hydrodynamics designers to know how submarines and other vehicles move through water. "Terradynamics" could provide designers with an efficient technique for understanding motion through media that flows around legs of terrestrial animals and robots. "Using terradynamics, our simulation is not only as accurate as the established discrete element method (DEM) simulation, but also much more computationally efficient," said Zhang, who is a graduate student in Goldman's laboratory. "For example, to simulate one second of robot locomotion on a granular bed of five million poppy seeds takes the DEM simulation a month using computers in our lab. Using terradynamics, the simulation takes only 10 seconds." The six-legged experimental robot was just 13 centimeters long and weighed about 150 grams. Robots of that size could be used in the future for search-and-rescue missions, or to scout out unknown environments such as the surface of Mars. They could also provide biologists with a better understanding of how animals such as sand lizards run and kangaroo rats hop on granular media. "From a biological perspective, this opens up a new area," said Goldman, who has studied a variety of animals to learn how their locomotion may assist robot designers. "These are the kinds of tools that can help understand why lizards have feet and bodies of certain shapes. The problems associated with movement in sandy environments are as important to many animals as they are to robots." Beyond optimizing the design of future small robots, the work could also lead to a better understanding of the complex environment through which they will have to move. "We think that the kind of approach we are taking allows us to ask questions about the physics of granular materials that no one has asked before," Goldman added. "This may reveal new features of granular materials to help us create more comprehensive models and theories of motion. We are now beginning to get the rules of how vehicles move through these materials."